Reading code in Open Source projects is a good way to learn, especially if the project has been around a while and been successful, or if you already respect the team of people working on it. Less reliably, you can find snippets of code by searching and sharing code. Many years ago, Omar Shahine wrote a great little app called Clean Sources. It added a right-click menu to the Windows Explorer that would delete your bin, obj and setup folders. Later, Jeff wrote Clean Sources Plus. It added a "Clean and Zip" option as well as support for removing source control bindings. Now, Steve Dunn has extended these to create Tree Trim, a command-line tool to do all this and more. He's extended it to include a plugin model that creates a little pipeline of plugins. You can chain them together and extend the command-line with your own plugins, and MEF (Managed Extensibility Framework) is at its core. Tree Trim is convenient for build servers where you want to, for example, make a working copy, delete source control bindings, zip stuff up, email it, etc. Each command line argument is a "task" and each command line arg (moniker) maps to a object. It's significant that order of arguments matter, so the args cause the plugins to run in order, like "make working copy, delete bin/obj, zip up, email." The code is actually very easy to read and is up at TreeTrim on Google Code and check out the FAQ. 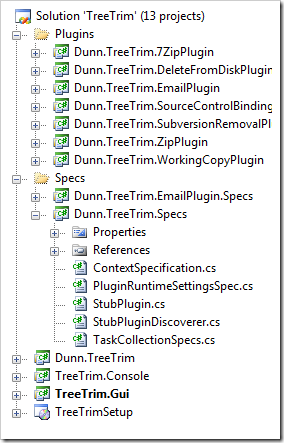 Plugins are super easy with MEF and Tree Trim has some good examples of a number of things. First, just plugins in general, but also a technique for passing settings to plugins. You can easily create context menus in Explorer for this tool (or any tool). Add a Key to the Registry like below. Steve is also starting to setup tests using XUnit. He's starting to use the ContextSpecification Pattern for his tests, so it'll be interesting to see if he completes the tests. That part is pretty basic so far. Check out the TaskCollectionSpecs.cs as an example. All in all, fun to read, and an interesting tool I'll use to quickly clean and send code samples around. I may extend it with a plugin to upload to my blog, then put the link in the clipboard. That could make blogging samples easier. I really like the simplicity of the plugin framework. It just reinforces my theory that a well thought out design will typically result in clean and elegant code. Good post. Nice to see how simply the MEF functionality fits in. I like plug-in (add-on) very much, it really save me lots of time! If the plug-in occupy less resource, it will be better.